So, we had the orange sunrises of the Canadian wildfires. We had a the gloom of days of overcast and the dumping of rain, rain and more rain. And then we had this. I didn't do anything to this photo. We were under a severe thunderstorm watch at the time. 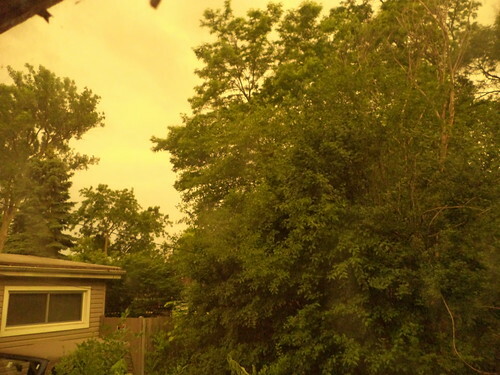 As the front with the storms advanced toward the Chicago area, it removed the shorter light wavelengths associated with blue, leaving only the yellow, orange, and red spectrum. This light is usually attached to supercells, those big, big thunderstorms which produce lots of rain and high winds. While the heavy clouds of a frontal boundary are worrisome, I think orange skies make me more nervous. 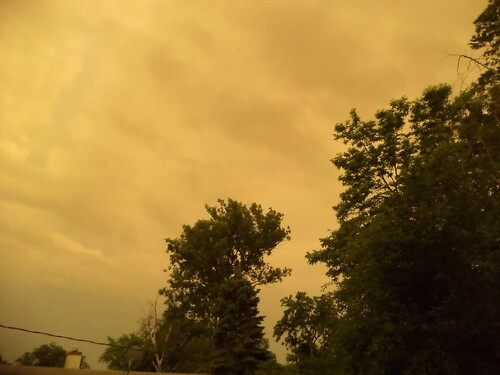 It seems, in my experience, that orange skies bring unusually strong thunderstorms. If I remember correctly, this was the storm that dropped 2 inches of rain in 3 hours and pushed the water into my basement. Photographers talk about a "golden hour", a time, at sunset, when the light is just perfect for photography. 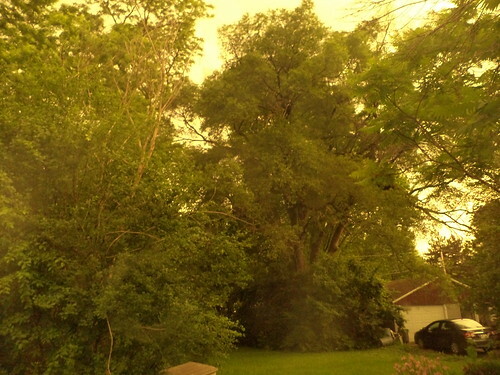 This isn't what they are referring to, but it does make unusually colored photos.